Hi Everyone. 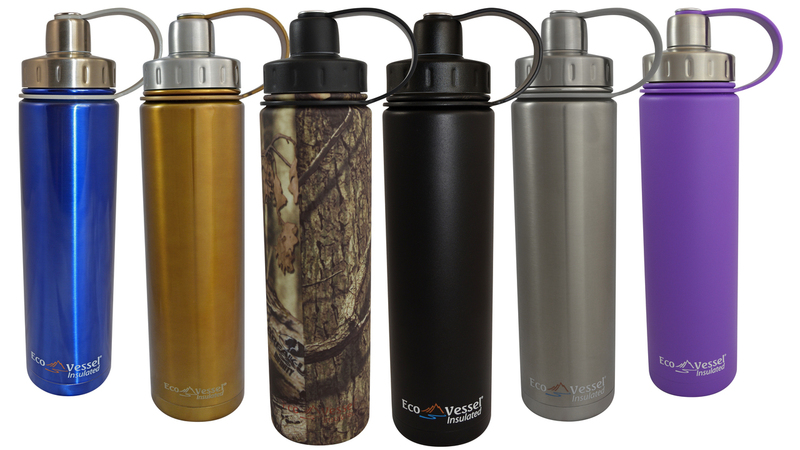 Today I’m going to talk about the Eco Vessel Boulder insulated water bottle. 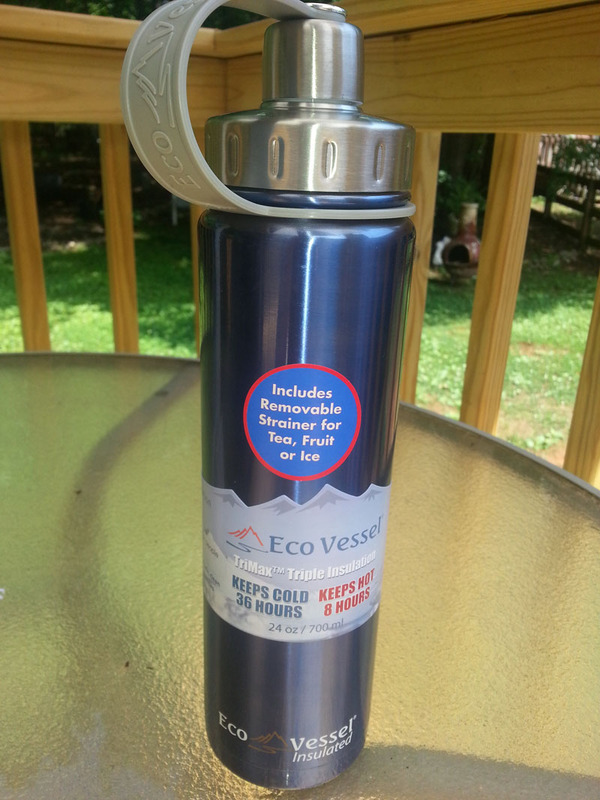 Approximately 2 months ago I received a triple insulated steel bottle from Eco Vessel. Below is a full description from the wording that is on manufacturer’s site. Performance with Style: The Boulder is our flagship bottle that enjoys wide popularity, especially with its updated slimmer body and sleek profile. You can fill this bottle with both cold and hot drinks and take it anywhere, since its secure top will keep your drink inside where it belongs. So, toss in a tote bag or backpack and hit the trails, golf course, run errands around town or keep on your desk for convenient hydration through the day. When I first opened the package from Eco Vessel – to me it looked like any other steel bottle I have seen before. Not so fast! Once I started using this insulated bottle I realized why it is so different than any other steel insulated bottle I have had in the past. Metal tastes? One of my first thought was I figured it would taste like metal. Which is the reason I had stopped using most metal drinking bottles I had in the past. The Eco Vessel never had a trace of metal I simply washed with warm water & dish soap before using. Keeping water cold: I live about 30 mins north of Atlanta which was very hot during the month of June. Usually any metal bottle I take out with me – when left in the car even for a short time while running errands – I might as well put a tea bag in the water to make hot tea. This was the opposite with Eco vessel! Over the past month I have taken the Boulder steel bottle with me almost everytime I have gone out to run errands. Almost every time I’d fill the bottle with tap water & a few ice cubes. One hour trips into a supermarket & the water was still ice cold. Then one time I left the bottle in the car over night & 24+ hours later the bottle was warm to touch on the outside but the water inside was still cool to drink! This was in approx 92+ degree humid weather inside a car – I was amazed! Almost thought it was a fluke. So I tried again during one of the hottest days we recently had. Eco vessel claim to keep liquids cold up to 36 hours – that is no joke. At least during my test when leaving the bottle in a hot car. The design is nice & slim – was easy for me to fit in any side pocket of a backpack I used. Cap is easy to screw on & off. I didn’t drop it off any tall buildings but It seems to be a solid design. The little strainer is a nice feature where I added lemon a few times. When rolling around in the car the bottle never leaked. Bottom line – If I have any other metal bottles still hiding in the back of my kitchen cabinet they are going to go in the box labeled for yard sale. Going forward this will be the only insulated metal container I will need. Eco vessel sent me this product free of cost in return to test & write a review. The words & my opinion that I typed above are my own words & opinion.